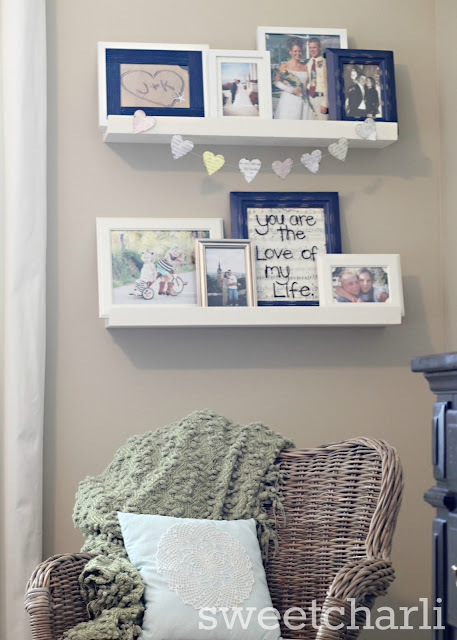 So here are the gallery ledges that I just recently put up in my bedroom since doing my SWEET MASTER MAKEOVER. I had my bro-in-law build me these shelves that we adapted from HERE. I got all the white frames from Ikea, the blue ones from Hobby Lobby. Just a brief background on my hubby and me. We met in elementary and I had a huge crush on him. Obviously he wasn’t interested in girls at that age, but in Jr. High he took a liking to me and we have been keen on each other ever since! We dated in high school, then he served an LDS mission, came home two years later and we got married! 🙂 Needless to say, we have plenty of sentimental pictures, letters, movies stubs, etc. 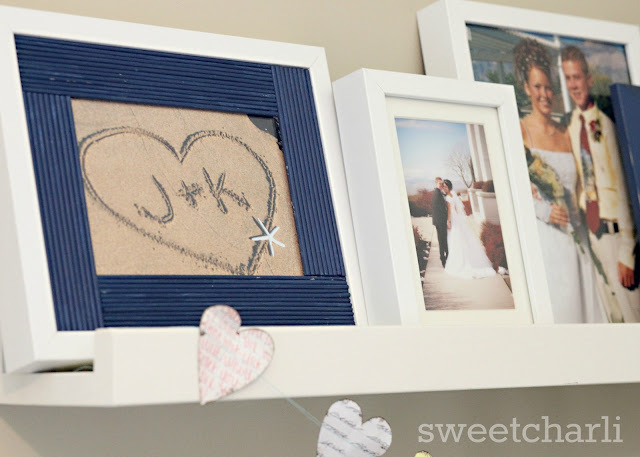 I thought I would incorporate some of our meaningful items into our bedroom, particularly these gallery ledges. Most of these pictures are not something I would normally display in my home, not because I’m ashamed of brace face in my 7th grade picture (okay, maybe so), but I’d rather display more recent pictures of us. I must say, however, I just love this display of old pictures because they bring back so many memories and they remind us of our legacy together! 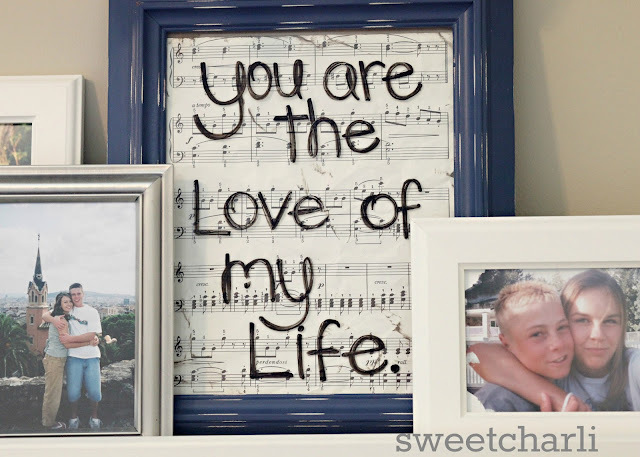 I really wanted to frame a sheet of music of our wedding song. “You are the Love of My Life” by Jim Brickman, has so much meaning to us. It was used in our wedding video, we danced our first dance as a married couple to it, and basically, this song describes our relationship to a T! I just took some old sheet music and crumbled it in a ball so it was wrinkly. I took some of my antiquing ink and rubbed a little here and there, then put it in my frame. Next, I took a dry-erase marker and wrote the title of the song directly on the glass of the frame. I love how it turned out and I also love that it’s not permanent in the case I want to change it! Now, as you can imagine, we have tons and tons of love letters starting from 7th grade up until now! I thought I would make a simple bunting by cutting hearts out of a few of our letters and sewing them together. I love the look of the different colored paper and ink that was used, it gives it a nice contrast. Don’t be afraid to pull out items from when you and your hubby were dating and incorporating them into your home. In fact, make it a date night! 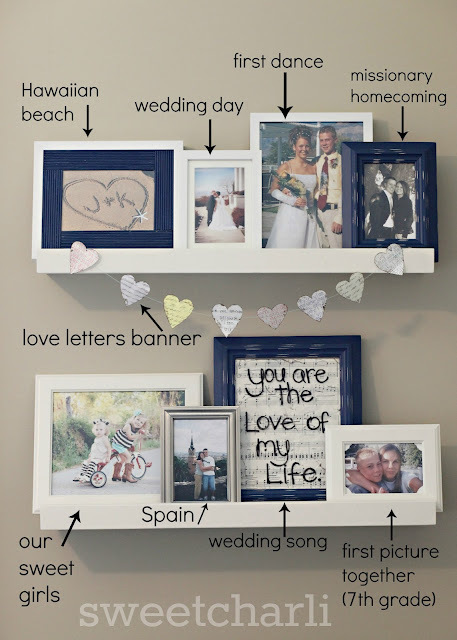 It was so fun to open up our boxes full of letters, pictures, and other momentos. We had lots of good laughs over these things! It’s sad that they have been collecting dust over all these years but so nice to see them out in the light and in one of the focal points of our bedroom! Darling idea Kam! 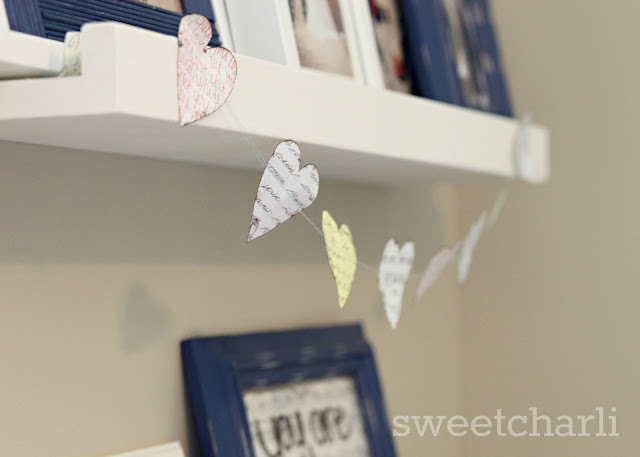 Love that you used your love notes to make the bunting. But, my favorite thing is the first dance pic! Awesome!!! Oh wow!!! Yes all of our fun pictures and momentos are collecting dust. I can hardly wait to get them out now! Thanks again for the fun ideas. So sweet, you two are darling!